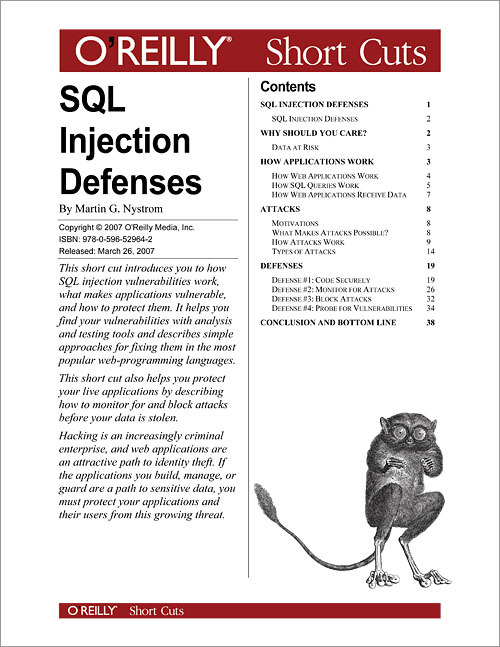 This Short Cut introduces you to how SQL injection vulnerabilities work, what makes applications vulnerable, and how to protect them. It helps you find your vulnerabilities with analysis and testing tools and describes simple approaches for fixing them in the most popular web-programming languages. This Short Cut also helps you protect your live applications by describing how to monitor for and block attacks before your data is stolen. Hacking is an increasingly criminal enterprise, and web applications are an attractive path to identity theft. If the applications you build, manage, or guard are a path to sensitive data, you must protect your applications and their users from this growing threat.